The ADT Pulse thermostat is a programmable thermostat and then some. Much more actually. It is fully integratable into the ADT Pulse system. You can manage it from your ADT Web Portal, an ADT Pulse touch screen keypad, manually on the thermostat or from any mobile device via your ADT Pulse app. It's also simple to use. Because it can be set up in your web portal through a series of pull down menus and simple selections to set up. If you can play Candy Crush, you can program this thermostat. You can as well use it with schedules, an automations, or a modes. Or in English, you can have the lights come on Mon-Fri at 6pm like clockwork (a schedule) or turn down to 60 degrees whenever the alarm is set to Stay Away (an automation.) For modes, let's say you travel often and don't want to reprogram the system every single time you travel. You take 5 minutes and set-up what the thermostat should do in a "Vacation Mode." Maybe it should turn off completely unless temperature falls below 40. If that happens, send a text and heat the home to 40. No way are you going to return home to frozen and burst water pipes! When you leave, select Vacation Mode and you are all set. A mode will override any other settings until you deactivate it. We've all watched too many infomercials and are now thinking, "Great! But wait. There's even more, right?" YES, of course. The Pulse thermostat can also trigger text and email alerts. They alert you of things you tell it to keep you informed about. For example, you might want to know if your teenager turns the thermostat to 90 instead of putting long pants on. I would want to know if that happens. And I am definitely not accusing my son of doing that when I am not home. But if he does, I am getting a text to let me know. So to recap, the ADT Pulse thermostat works with every aspect of your pulse system and is simple to use. At $169, it's a very affordable option for a thermostat. They literally threw out the mold when they created this thermostat. This mold isn't even shaped like a thermostat mold. For starters it's round and has no buttons. It's like the standard thermostat's new age cousin from Hollywood. Slick, shiny and brightly dressed. Let's cover the possible cons first. It costs $249 and $49 to install. It also does not fully integrate into the ADT Pulse system. It CAN be controlled by your ADT Pulse mobile app. So one app instead of two... Hooray! It CANNOT, however, be controlled by the touch screen keypad or web portal and it cannot be triggered to respond to the actions of another device like having the thermostat turn down when the garage door shuts behind you. On to pros. As stated, this is a whole new type of thermostat and possibly doesn't need external control beyond an app. That's because its job is to figure you out and do exactly what you would do, and do it by itself. And the little green leaf icon, that lets you know you are staying within the economical spectrum. The Nest is installed in about an hour including time to set up apps and all. Then you just live your life with it. It's clear that the Nest founder is the same guy responsible for a lot of the iPod's design. Controlling is done by one round dial. Turn to what you want and push to select. If the temperature is 50 and you want 75, tap and turn to 75 and tap to set. Once you do this a few times, it will realize 75 is your sweet spot. If you set the temp to 60 a few days in a row at 7am, it will realize that 7am equals 60 degrees in your opinion and so on. After about a week of this it will pick up your habits and mimic your rhythm. Reviews rave about Nest's ability to get to know you accurately... if only spouses worked this well. And another nice feature... don't you love it when you see a friend and their whole face lights up because you've arrived? Your Nest does that too. There is a built in motion sensor. When you are around, Nest lights up. This allows you to see the time or temperature from quite a distance. (And feel a little loved.) This technology also allows your Nest to realize when there is no movement and will revert to an away temperature automatically, even if it has learned that you usually have another setting for that time period. The reality is you can't go wrong with either thermostat. An ADT Pulse thermostat is about $130 nicer to your pocket book and boasts the qualities that one generally looks for in a "connected home." It works with all the other systems and they work off each other. 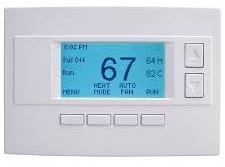 When utilizing a mode, you are having a plethora or actions and instructions carried out by one click, and it is nice to include your thermostat in the mix. The Pulse thermostat can be controlled with your touchscreen keypads, through your web portal and by mobile app whenever or where ever you are. The Nest learning thermostat, for lack of a less cliché way of putting it, is SOO COOL! I have never looked at a thermostat and thought, "wow you are an eye sore." But, now I might. Looks wise, Nest makes most other thermostats look like odd square protrusion from the wall. It also takes on the responsibility, and quite well, of learning your lifestyle so you are not required to program it, although you are able to manually program it if you desire. This feature, for some, will compensate for it not "playing-nice-with-others" as it is such an outstanding standalone product. It is exciting and convenient to be able to control the Nest thermostat through your Pulse app. Ultimately, you will have to decide for yourself if it is more important to have a thermostat that fully integrates into existing home automation, or if the fact that Nest acclimates to your lifestyle, makes it able to stand on its own and be equally beneficial. If you would like to see exactly how these things work, schedule a FREE home security review and see the two technologies side by side or give us a call at 1-800-310-9490.